I already decided to finish my professional chess career a couple of months ago and now, after having played my last tournament, I would like to announce it publicly. The life of a professional chess player was a great journey and I am very thankful to chess for all it has given me. It has sometimes been difficult, sometimes more successful than I could ever imagine, but in any case it has been a priceless human experience for me. I have always tried my best to give it all from my side, being fully involved in it while working and playing chess. But I have also expressed in interviews before that I would like to try doing something else one day, and since my chess player motivation has dropped significantly in recent months, it feels like the right moment for it. I would like to concentrate on projects which I have been developing during the last months especially in the field of chess for children and education. I will soon provide more detailed information about those. I might still like to play a rapid or blitz chess tournament at times, or do a simultaneous like the Tata Steel Chess simultaneous in the Dutch parliament building this afternoon and will participate in various events connected with chess, popularising this great game. 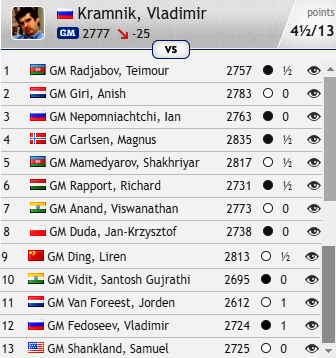 Despite the dire results in the Tata Steel Masters the retirement remains a great loss for chess, since the aggressive, wildly optimistic Kramnik of recent years had been fantastic to watch, and he had also shown he was still capable of beating anyone. It would have been great to see him in this year’s knockout qualifiers for the next Candidates Tournament. 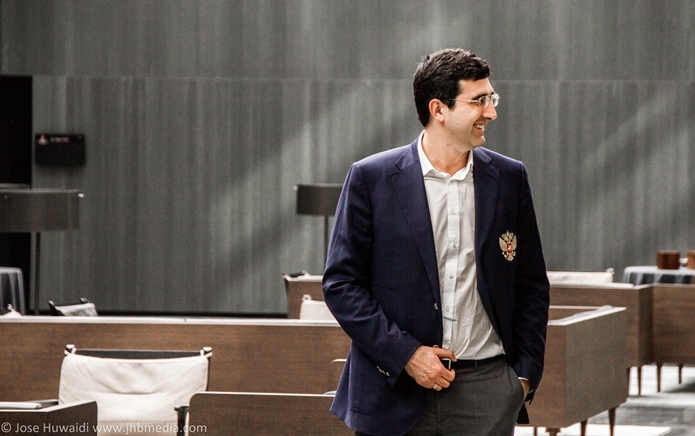 The only consolation is that Kramnik actually mentions still playing in rapid and blitz events, so it seems it won’t be as difficult to get him back into the game as it was with Garry. It’s not the time to write a chess obituary of the 14th World Chess Champion, but it may be worth reminding younger chess fans of the career of one of the best players of our time. Vladimir Kramnik was born on June 25th 1975 on the Black Sea in the provincial town of Tuapse, Russia. When the kid became too good for his local mentors Grandmaster Vitaly Tseshkovsky (a man Kramnik said “loved chess too much”) took over, with Vladimir also coming to the attention of the Botvinnik School in Moscow. Garry Kasparov then vouched for the 16-year-old Kramnik’s inclusion in the 1992 Olympiad. The untried youngster scored 8.5/9 and the tournament’s best rating performance, and after that there was no looking back. Three years later he’d become the youngest player to reach the world no. 1 spot, a record only later beaten by Magnus Carlsen. 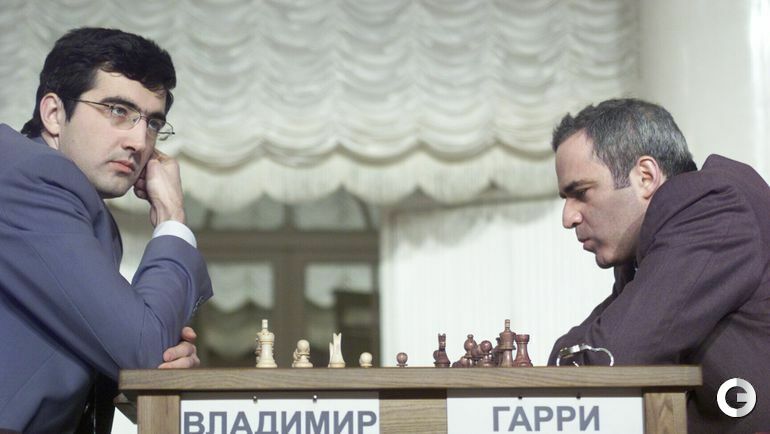 The defining moment of Kramnik’s career came in his 2000 match in London against Garry Kasparov, a player at the time still close to his phenomenal best. In the run-up to the event Kramnik transformed his style from the fearless attacking approach of his youth to become almost impossible to beat. He famously deployed the Berlin Defence with Black, so that Kasparov was the first to experience the frustration of trying to break down that wall which would go on to dominate top level chess for the following two decades. On the other side of the board Kramnik unleashed more deep opening ideas to help himself to two wins and overall victory. Garry didn’t win a game. Kramnik’s reign coincided with a schism of the chess world, but he held on to the title against Peter Leko in 2004 and then won a hugely acrimonious “reunification” match in 2006 against Veselin Topalov to become the undisputed World Champion. He finally met his match in Vishy Anand, who first won the title in a tournament in Mexico in 2007 and then retained the title in their match in Bonn in 2008. If Kramnik had simply faded away he would still have been one of the greats of chess, but instead he managed to transform himself back to something approaching the swashbuckling player of his youth. 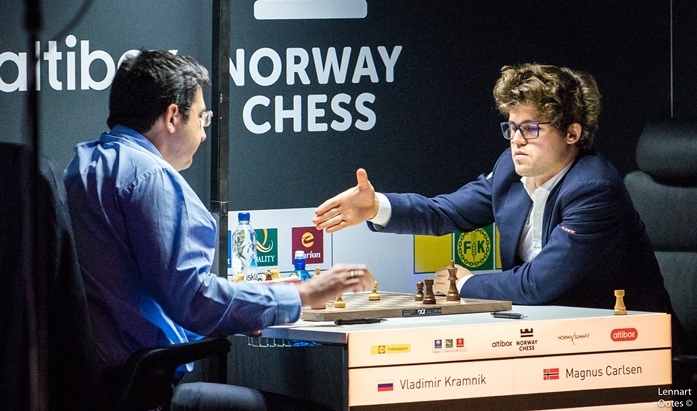 He proved a match for the rising stars of chess, giving Magnus Carlsen a run for his money as the Norwegian rose to the top. Most memorably, the 2013 London Candidates tournament became a two-horse race between Kramnik and Carlsen, with Vladimir ultimately only missing out due to the tiebreak of most wins (he had 4 wins and 1 loss to Carlsen’s 5 wins and 2 losses). Magnus would go on to beat Vishy Anand in their 2013 match and start a new era in chess, but until today Vladimir Kramnik remained one of the most competitive and colourful parts of that era. As well as the World Championship crown Kramnik has won almost everything there is to win: Olympiad gold, the World Cup and countless supertournaments, including a record 10 Dortmund titles. There was a scare in 2006 when he took a 6-month break from chess for treatment of a form of arthritis, but despite Kramnik constantly claiming he’d retire at age 40 or before he stuck around for new generations of chess players. He’ll be greatly missed! 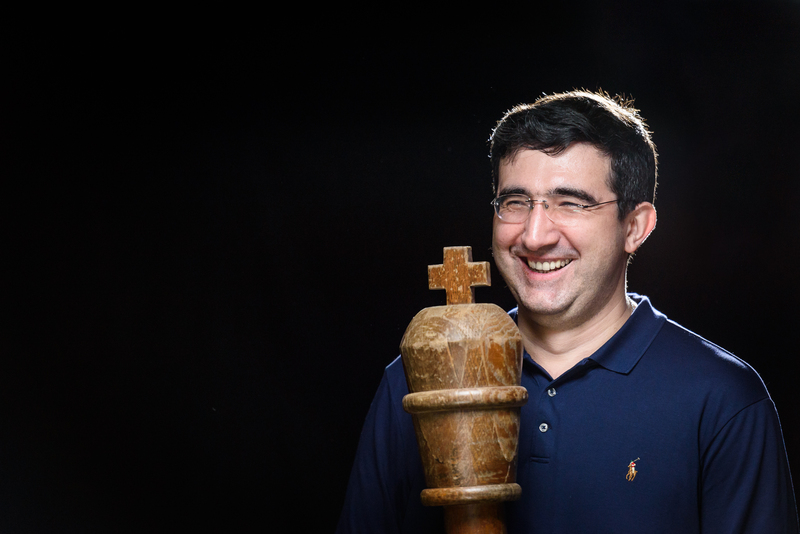 We'll have more on Kramnik's retirement in the coming days!